This month’s composition is a little different from the form I normally follow. I wanted to get a nice bright single star image, but I also wanted something else of interest in the field of view apart from other stars. So I took a good look at the star map to see if there was a main star with something nice and interesting lying close by. 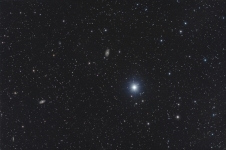 I came up with Phecda in Ursa Major for the bright star, and lying close by are the spiral galaxies M109, NGC3953, and a bunch of other galaxies too. This image was taken with the Sky 90/M25C combo piggy-backed on the C11 in the south dome. For this image I used 10-minute subs as I wanted a decent exposure for the little galaxy (and to stand a chance of seeing all the other faint fuzzies in the region). My notes tell me that I managed to get 27 sub-exposures in all and managed to use the lot giving me a 4 and a half hour total exposure time. It came out well enough, but of course it would have benefitted from even more time – I usually try for 8 hours if possible using the Sky 90/M25C and 10-minute subs meaning somewhere around 50 subs in total. This is pretty much the “sweet-spot” for imaging from my moderately light-polluted location with the Sky 90/M25C. More subs will give a smoother image but beyond 50 and you are definitely entering the realm of diminishing returns where it takes a LOT more extra subs to make any noticeable difference. The clocks have gone back, and if only the Gods would give us some clear decent skies we could be out imaging by 6:00 p.m. Weather hasn’t been kind to us for a couple of weeks and as we are now getting into winter constellation time I am wishing for a change for the better in our weather. The mini-WASP is built and ready to go so it isn’t as if I’ve just bought a load of new kit for the weather to mis-behave in this way. Here’s hoping we have some improvement during this November so that I have something interesting to report next month.